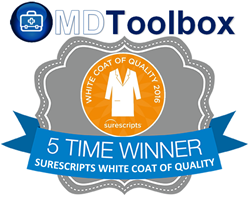 MDToolbox-Rx e-Prescribing software earned the 2016 Surescripts White Coat of Quality Award for clinical quality and best practices in e-Prescribing. Providing the best possible e-Prescribing workflow in order to reduce errors and increase patient safety is a main focus in our product development at MDToolbox. MDToolbox, an industry leader in both stand-alone e-Prescribing software and e-Prescribing integrations, has been honored with the 2016 Surescripts White Coat of Quality Award. This is the fifth straight year that MDToolbox’s flagship e-Prescribing product, MDToolbox-RX, has received the award. MDToolbox is a Health Information Technology software company providing innovative solutions. MDToolbox-Rx, the flagship product, is a complete e-Prescribing system that is used by stand alone medical practices and facilities, as well as integrated seamlessly with other Health IT systems nationwide. MDToolbox-Rx offers a highly customizable and simple to use electronic prescribing system that is Surescripts®, Meaningful Use, and EPCS certified. For more information, please visit http://www.mdtoolbox.com.